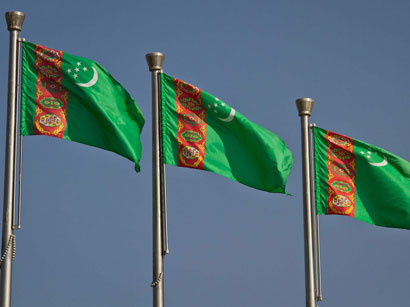 Construction of the artificial lake Altyn Asyr, which is in the center of the Karakum desert, will allow Turkmenistan to create an emergency supply of water, Trend reports via newspaper "Neutral Turkmenistan". It is expected that due to natural filtration and various know-how, the reservoir can be used for the development of new lands, expansion of pastures, irrigation of green spaces, technical needs. Lake Altyn Asyr is intended for collecting drainage water from irrigated lands and diverting them to the giant natural holloü Garashor in north-western Turkmenistan. The capacity of the reservoir will be 132 cubic meters. The length of the lake is 103 kilometers, the width - 18.6 kilometers, the average depth - 70 meters. The total length of all drainage collectors included in the system of the lake is 2,659 kilometers. The volume of the Ak Yayla reservoir, where the water is collected, which is then discharged into the lake, is 970 million cubic meters. The creation of a large artificial reservoir in the Karakum has made it possible to radically improve the ameliorative condition of irrigated lands in all regions, to solve many problems associated with soil salinization, waterlogging and drought, the report said. The project is included in the Action Program for the Improvement of the Ecological and Socio-Economic Situation in the Aral Sea Basin, which is being carried out as part of the International Fund for Saving the Aral Sea (IFAS). Special equipment made by Komatsu (Japan) and Caterpillar (USA) was purchased for the construction of the lake. The total amount of investments allocated from the state budget for the implementation of the project, currently amounts to $553.378 million. "Neutral Turkmenistan" notes that the impetus in the region was given to animal husbandry, also by expanding the area of pastures in by 8.640 million hectares of land. This made it possible to have additional 4.6 million heads of small cattle and 60,000 camels.